Alex Hobbs of Boise State tries to block the three-point attempt by Jordan Caroline of Nevada during the second half at Lawlor Events Center on February 02, 2019 in Reno, NV. Nevada won the game 93-73. It’s hard to pick apart Boise State’s effort in its loss Saturday afternoon in Reno. Sometimes the other team is just better. BOISE, Idaho — Monday, February 4, 2019. Boise State didn’t play that badly at Nevada Saturday. The Broncos shot 46 percent from the field and 43 percent from three-point land. They were outrebounded by just two and kept their turnover count manageable at 11. But when Nevada has it going the way it did in Lawlor Events Center, there’s not much you can do. 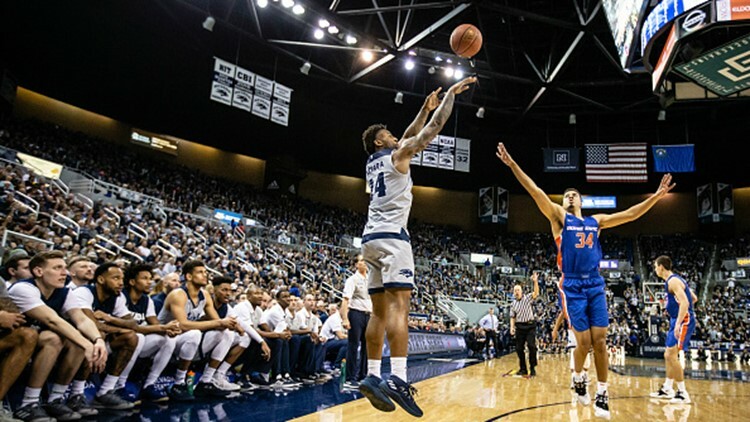 The eighth-ranked Wolf Pack was lights-out, hitting 56 percent from the field and draining 13 three-pointers. The Pack also turned the ball over just four times and still had only one turnover with 6½ minutes left. That’s how this game ended up in Nevada’s corner 93-73. It was easily Boise State’s worst loss of the season in terms of margin, but it didn’t feel terrible. It was the usual culprits for Nevada. The Martin twins were about as good as they’ve ever been together. Caleb hit the 30-point mark, and Cody added 21, as they combined to go 17-for-27 from the field with seven three-pointers and 10 assists. And Jordan Caroline produced another NBA audition with 13 points and 13 rebounds, his 13th double-double of the season. In any other game, this may have been enough for a Bronco victory: 21 points from Alex Hobbs and 19 from Derrick Alston and Justinian Jessup. Alston, who also led Boise State in rebounding with seven, seemed to relish the big-time competition and made a lot of big buckets. It’s just that the Pack answered just about every one of them. Boise State was without RJ Williams, who was left home due to illness. Williams’ athleticism may have helped against the high-flying Wolf Pack in the paint, as there was a certain gear the Pack stars could hit that the Broncos couldn’t match. But Williams has been spotty in conference play, reaching double figures only once. He played only eight minutes in the first game versus Nevada, scoring two points. My favorite tweet during Super Bowl XIII Sunday night came from the Mountain West fan site, MWCConnection.com: “The First Responder Bowl had a better first half than this.” Patriots 13, Rams 3. The End. Next? There was news over the weekend affecting Boise State’s next attempt at playing a full 60 minutes. Florida State, the Broncos’ season-opening foe August 31 in Jacksonville, has booted senior quarterback Deondre Francois off the team due to a violation of team standards. Francois has been the subject of domestic violence allegations from his girlfriend—and just got another. He threw for 2,731 yards and 15 touchdowns with 12 interceptions last season. There was an elephant in the room all the way through Leighton Vander Esch’s bid for NFL Rookie Defensive Player of the Year honors. His name was Darius Leonard of the Indianapolis Colts, and he won the award Saturday night in Atlanta. Vander Esch had a stunning rookie campaign and became one of the league’s most popular players. But Leonard led the NFL in tackles this season with 163, 111 of them solo, and added double-digit tackles in both of the Colts’ playoff games. The second-round pick out of South Carolina State deserved the trophy. LVE was third in the league with 140 tackles. The former Boise State star would have won it were it not for Leonard. The Colts were looking for an offensive line coach that had more of a teaching background in technique and fundamentals rather than a fiery rah-rah guy. Chris Strausser wanted to teach and coach without the rigors of the college recruiting trail and the sales job that goes with it, as he has the last two years as an assistant O-line coach in Denver. That made the Colts and Strausser a perfect fit for each other, and the former Boise State O-line coach was hired by Indy late last week. Strausser had two stints with the Broncos, one under Dan Hawkins and one under Chris Petersen. He followed Coach Pete to Washington but resigned in 2016. The Idaho Steelheads had one lead Saturday night at Allen. Fortunately for the Steelies, it was the final one, as Brady Noorish scored 40 seconds into overtime for a 4-3 triumph. Nolan Gluchowski had tied the game with three seconds left in the second period—then the teams battled through a scoreless third, setting the stage for OT. The Steelheads took Friday’s game as well, beating the Americans 6-3 behind two goals apiece from Alex Dahl and Elgin Pearce. That one was closer than the score indicated, as Idaho potted two empty-netters at the end. The Boise State women made their first 11 shots and charged out of the gate with a 30-point first quarter against Nevada Saturday. The Broncos had 50 points at the half and coasted home with an 80-65 win over the Wolf Pack in Taco Bell Arena. Boise State brought balance the scoring column again, led by Riley Lupfer’s 14 points. The victory, combined with New Mexico’s 82-73 win over Fresno State, keeps the Broncos and Lobos tied atop the Mountain West standings with 8-1 records. Boise State is 17-3 overall. This is some kind of winter for Canyon County college basketball. The College of Idaho men swept their weekend road trip, winning 64-55 at Evergreen State and 92-66 at Northwest University. The Yotes are now 23-3, matching their best 26-game start in school history. The Northwest Nazarene men, down by 27 points with 10 minutes left in the game, rallied unbelievably to defeat Montana State Billings 92-89 in overtime Saturday. NNU has pulled into a tie for first in the Great Northwest Athletic Conference. And the Nighthawk women, ranked fourth in NCAA Division II, improved to 19-1 with an 83-56 romp over Concordia Saturday night in Nampa. At 33 years old, John Madden becomes the youngest head coach in pro football when Oakland’s Al Davis taps him to take over the Raiders. Madden would lead the team for 10 glorious years, compiling a 103-32-7 regular-season record and, of course, a 32-14 win over the Minnesota Vikings in Super Bowl XI. He’s best known, though, for his NFL broadcasting career that spanned three decades, from 1979-2008.